Still eating pumpkin? Make soup! Actually, this is not my recipe, but was found on the Jamie Oliver website by my hubby, who helpfully made it last weekend when I was too busy to bother! After the Halloween celebrations, we still had a mountain of pumpkin flesh from the large carved pumpkin lantern that we made and a couple of beautiful, tasty mini munchkin pumpkins, that I bought because they were just too cute to leave in the shop. In the last couple of weeks I have been eating soup most days.... whilst the weather is still pretty mild for the time of year, the dampness heralds Autumn in all its colourful glory and with it, the family diet has shifted into 'almost winter' mode. Soups are such a comforting food and they do a fantastic job of filling your heart with warmth as much as your belly. This particular soup is no exception, and with a good hit of chilli, it leaves you glowing from the inside out. 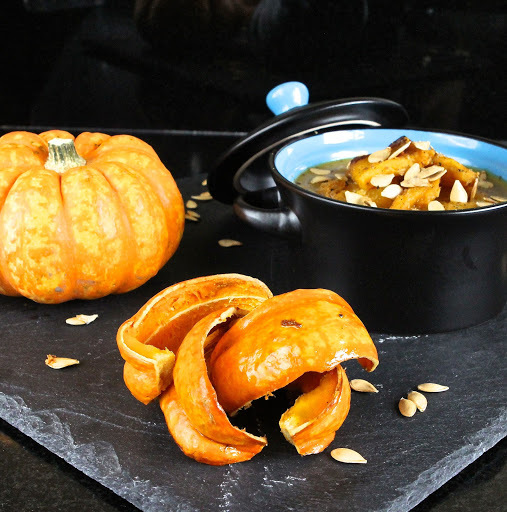 Mr GF only changed the recipe fractionally (by adding a drop of marmite for good measure), but I instructed him to leave a little spicy roasted pumpkin aside to top the soup at the end and also to roast some pumpkin seeds for sprinkling. Both added texture and interest to the final dish..... the roasted pumpkin chunks (which Mr GF thought would be too hot) were in my humble opinion, one of the best bits of the bowl and alongside the crispy crunchy pumpkin seeds, made an already deliciously tasty, healthy soup way beyond ordinary. We also used our own chilli powder made from chillies grown in the greenhouse, which we had carefully dried before grinding to a fine powder. Fresh and spicy, I smiled with each mouthful, knowing that we had nurtured them through to such perfection! Although we don't celebrate Thanksgiving in the UK, this would be a perfect offering at any festive table. And for those of you still celebrating the remnants of Guy Fawkes with fireworks that have had to wait for the rain to clear, a bowl by the bonfire will make sure you feel snuggled and pampered all evening. This recipe is a keeper...... simple but wonderful! 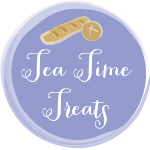 Tea Time Treats with Janie at The Hedgecombers and Lavender & Lovage. 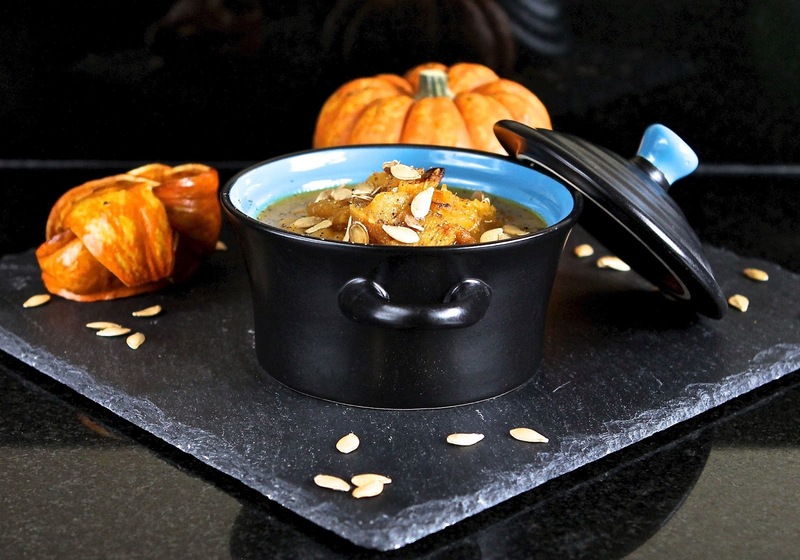 This month's theme is a perfectly seasonal Soups, Broths & Stocks. 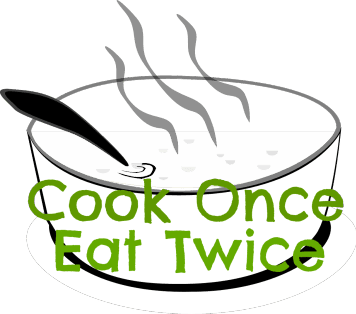 Cook Once Eat Twice with Searching For Spice. We got a good couple of meals out of this recipe. 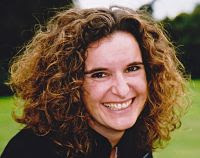 Credit Crunch Munch with Elizabeth's Kitchen Diary on behalf of Fuss Free Flavours and Fab Food 4 All. No Croutons Required with Lisa's Kitchen and Tinned Tomatoes. 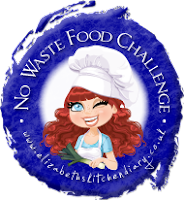 The No Waste Food Challenge with It's Not easy Being Greedy on behalf of Elizabeth's Kitchen Diary. 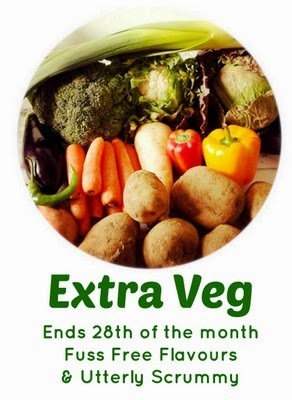 Extra Veg with Helen at Fuss Free Flavours and Utterly Scrummy. 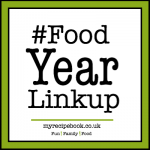 #FoodYearLinkup with Charlotte's Lively Kitchen. This dish would be great for Guy Fawkes (or for celebrating Thanksgiving across the pond). 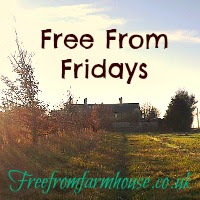 And finally : Free From Fridays with Emma at the Free From Farmhouse. Remove the stringy bits from the seeds and place the seeds into a colander or sieve and rinse thoroughly with water until clean. Place them on kitchen towel to dry off. In a small dish, toss the pumpkin seeds in a little olive oil and spread them on a separate baking sheet. Sprinkle with a little salt. Set aside. Grind the chillies with the coriander seeds and a pinch of salt until you have a fine powder. Drizzle the pumpkin with a little olive oil and sprinkle over the freshly ground spices, with a good grind of black pepper. Roast the pumpkin for about an hour until it is soft and slightly caramelised at the edges. At the same time, roast the pumpkin seeds for 30 to 45 minutes, stirring occasionally. Whilst the pumpkin is roasting, chop the onion, garlic, carrot and celery. In a large saucepan, heat 2 to 3 tablespoons olive oil over a medium heat, add the chopped vegetables and sauté for about 15 minutes until softened, but not browned. Set aside until ready to add the pumpkin. When the pumpkin is cooked, remove the flesh from the skin and add most to the saucepan with the hot vegetable stock. 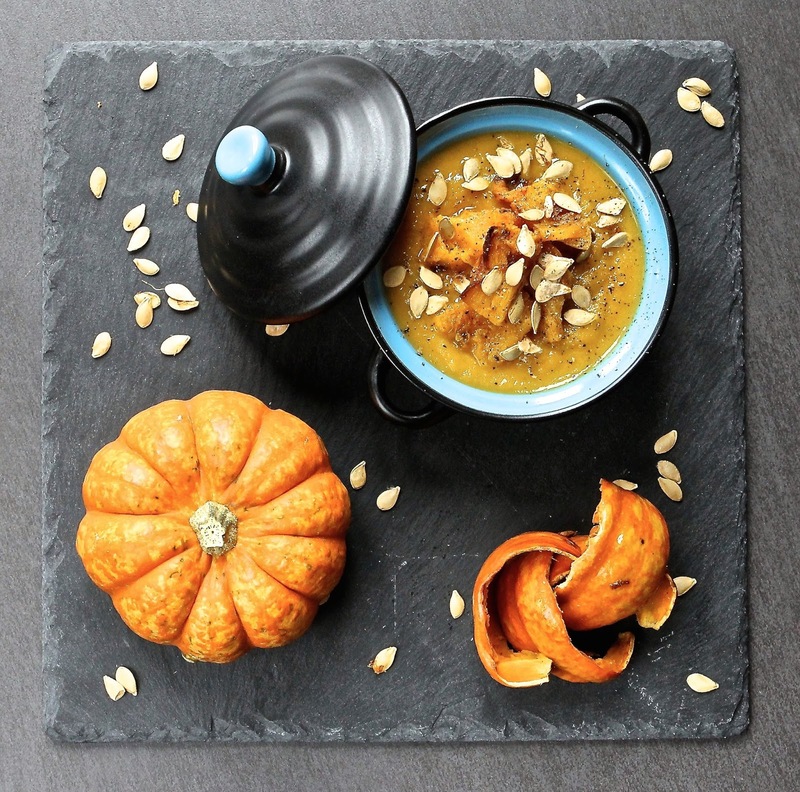 Reserve a little pumpkin to top the soup when ready to serve. Use a stick blender (or liquidiser) to blend the mixture until smooth. Check the consistency and add a little water if too thick. Heat the soup through thoroughly before serving topped with the remaining roasted pumpkin and roasted pumpkin seeds. Thanks Corina. 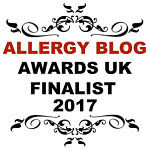 Mr GF adds marmite to pretty much everything (yet he hates to eat it on its own)! Shame that your pumpkin was off.... I wonder why? They usually last for ages! 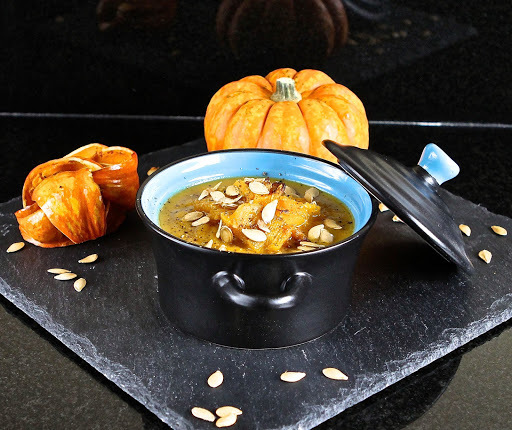 Pumpkin soup is a classic that I always love in all its variations - though I am always wary of roasting pumpkin seeds like I see done in other countries - wonder if our seeds would do this as well because ours are slightly different but I do think they look gorgeous in your photo! And that is nice you are getting a helping hand with getting through the pumpkin. Pumpkin seeds are so easy to roast, it would be worth trying a few with your local pumpkins to see how they turn out. At least then you will know whether they work or not! Do you get pumpkin at this time of year in Australia (what with the back to front seasons)? such pretty pictures and it really does sound glorious!... 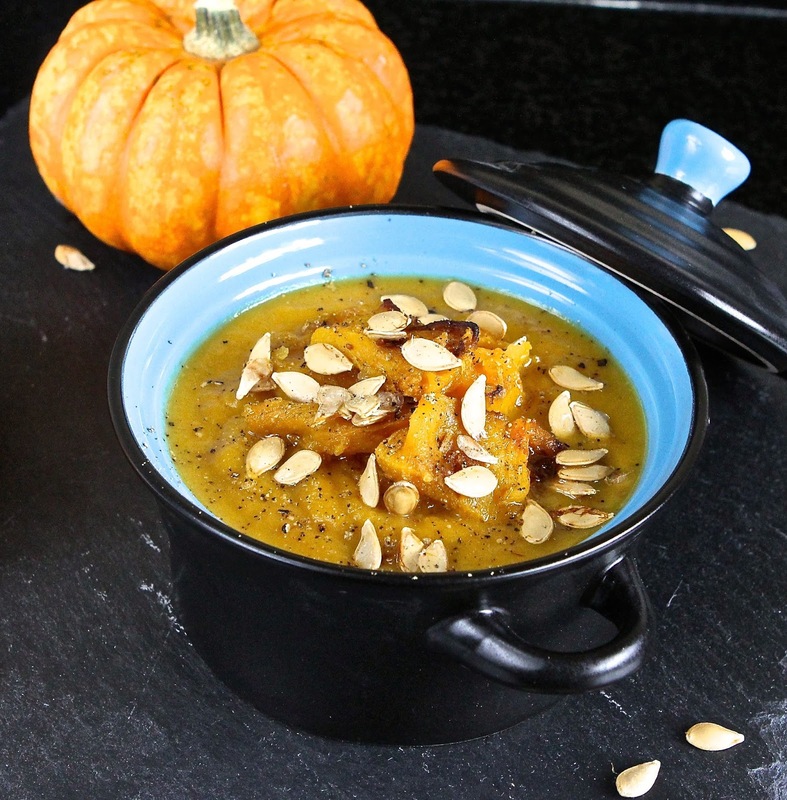 I adore pumpkin soup, so silky! I too have been eating loads of soup recently. Just love the stuff! Thanks Dom. I was real pleased with these photos. Some of my pics have been a bit hit and miss lately, but the bright pumpkin orange is so photogenic! It is definitely soup season...... I can't get enough of it either right now! Thanks Camilla. Home-dried chilli is the best! We dry it and string it up in the kitchen and it lasts all year. I have an interesting yellow variety this season, which is still fruiting in the greenhouse! I rarely make soups as my little stick blender isn't up to the job, I think I'll have to put a new one on my Christmas list. 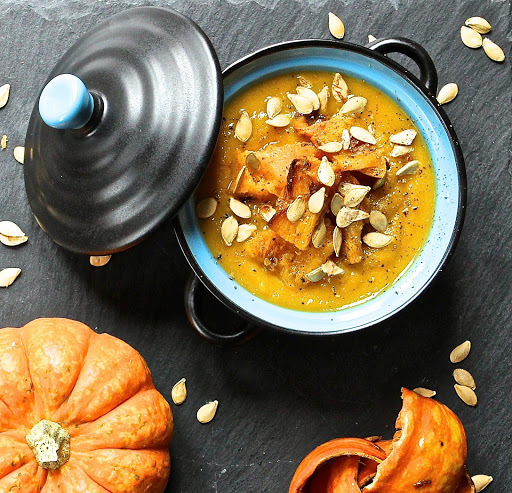 This soup sounds delicious and the addition of the pumpkin chunks and pumpkins seeds make it look really beautiful too. Oh no!..... You absolutely need a new one then! I am not sure I could survive without being able to blend up a quick soup! The pumpkin chunks were just amazing..... I think the texture and bite made all the difference to the enjoyment of the dish. Ha ha! Absolutely! Pumpkin rocks!!! It's definitely soup season and I've been making quite a lot of soups lately. I am intrigued by the addition of Marmite which I love and will try it with my next batch of butternut squash soup. I can't get enough soup at the moment! My hubbie seems to add marmite to everything savoury. It definitely adds a little extra depth. This looks fabulous Kate! I love the photos. I also love the fact that you made your own chilli powder...you are too cool for school!!!! I have no soup today so it will have to be salad for lunch although I would much prefer a bowl of this! Thanks Vicki. I have been really lazy with photos recently mainly for time reasons, but I was chuffed with these ones. The chilli powder is straight forward providing your chillies are dry enough. Looking forward to more soup though..... can't get enough of it right now! This looks delicious. Beautiful photos. I totally agree with you about those munchkin pumpkins - so cute! Awww thanks Eb. I always think Munchkin Pumpkins would look great on display, but they are far too tasty to hang on to! I do like a good pumpkin soup, it's the best time of year for it! I totally agree with you Caroline. Thanks for popping over! 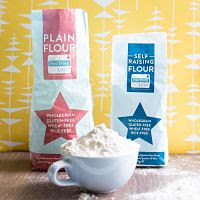 Lovely recipe and stunning photos. I like the idea of a little dab of marmite too! Lovely pictures and I can almost taste this soup. Pumpkin season is always a treat. Thanks for sharing with NCR. 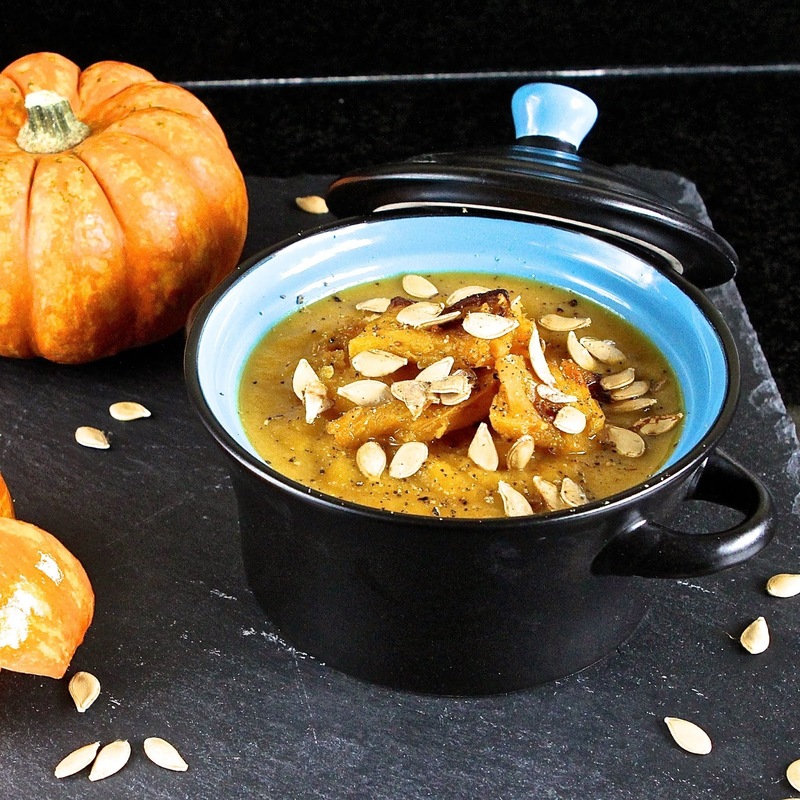 Mmm I do love a good pumpkin soup, me! I bet the marmite adds a really interesting flavour to it. Thank you for sharing with Credit Crunch Munch! Awww thanks Janie. Thanks for hosting.... I will pop over shortly!